Last year April, I took Khushi to Paris for the very first time. 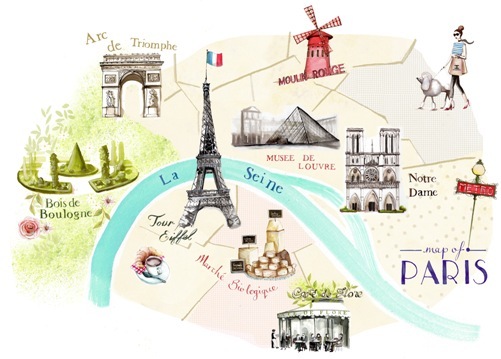 As you already may have noticed, I JUST LOVE AND ADORE EVERYTHING PARIS & PARISIAN! We took the Euro Star from London to Paris. We had brought some lunch and entertainment to keep us occupied during the journey. The scenery was absolutely stunning! As I wasn’t too sure on how to get to our destination; Saint Cyr l’Ecole (located in the western suburbs of Paris). I of course had to ask someone for help. I went to the shop on-board Euro Star where this very kind gentleman not only gave me a map over Paris and it’s trains, but who also explained how to get to our hotel. Once we finally arrived the lovely town of Saint Cyr l’Ecole, I had to take out my trusted Samsung Note 3 and open Google Maps to get the direction to where we were staying; Appart’City, Saint Cyr l’Ecole. The really cool thing about the Eiffel Tower is that it can be seen from anywhere in Paris because of it’s grand height (300m)! When we were standing under it, it was quite overwhelming – I felt dizzy at some point. But it was absolutely beautiful. The French walk everywhere. They walk to work, to the markets, to run errands – and it’s part of their daily routine. They’re not doing anything excessive, so if they don’t do high-intensity exercise, it’s because they’re already active. Khushi and I did the very same thing – one day we actually walked over 30,000 steps – from where we were staying; Appart’City, Saint Cyr l’Ecole to Palace of Versailles. Yes, we were sightseeing, but I’m sure the average French person walks more than 10,000 steps a day. They eat smaller portions and stop when they’re full. They’re always eating fresh, colorful, fruits and veggies, and butcher-cut meats. Their largest meal is during the day at lunch which means they’re burning their food off during the day. They also don’t snack. The French eat only when they’re hungry, and they actually take the time to enjoy their meals – usually with a glass of wine. The French are always smiling and are consistently appreciating life’s little moments. They live in the NOW. They don’t stress about the hustle and bustle of life. They have figured out a way to combine work and play and do it effortlessly by mastering the balance of life by incorporating the pleasurable things into the everyday; they leave the office for lunch, take a long walk after work, have a glass of wine each night – they’re living that ‘Joie de Vivre’ (express a cheerful enjoyment of life; an exultation of spirit) regularly. (read ‘How would you spend your Ideal Day‘ and download the free printable here). Eat everything you love (forget diets etc. ), just eat in moderation. Take your food seriously and respect it by giving it the time and attention it deserves. Be active! If you’re not a ‘gym’ person, go for long walks! Thanks to my new ‘Fitness Regime‘ my aim is: 13000 steps a day (comes to approx 2 hour walk – a total of 10km) and 30-45min Cardio at the gym 4-5 times a week. What I am definitely going to try is to have a bigger lunch and lighter dinner and see how it goes – will keep you posted 🙂 Until then; DESIGN THE LIFESTYLE YOU DESIRE AND CREATE WEALTH IN ALL ASPECTS OF YOUR LIFE!